Having a Shetland Pony mad daughter, Abigail, we went to Reading Shetland sale to buy a pony for her second birthday. First the colt foals, not what I was looking for, but into the ring came Bard, a wild colt down from Scotland with something special about him and for 12.5 guineas we just had to buy him. Later in the sale we bought a sensible 34” mare Lee Copper Coin for Abigail to ride. We had Bard gelded as a yearling and during his third winter broke him to ride with the help of a friend’s daughter Lindsey Robinson. From the start he showed great promise and ability. 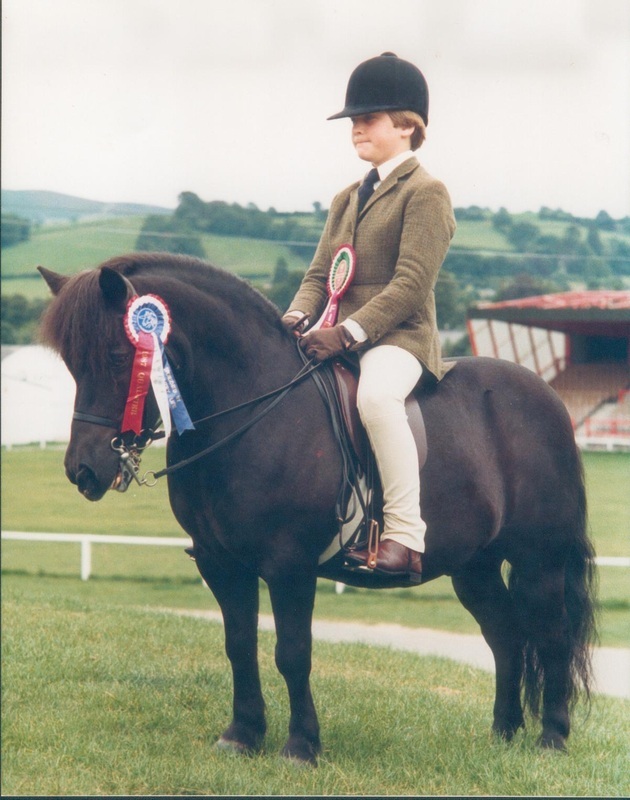 During his first year in the show ring with Lindsey he started winning, with the climax of his first season being 2nd Reserve Champion Mountain and Moorland at Ponies of Britain, as it was then, having been ridden by the Judge, Nigel Hollings. This was the start of a brilliant career. Abigail took Bard to Pony Club. He attended rallies and when it came to the junior one day event, many wondered why we had bothered to go with a Shetland. They were about to find out. After getting a very respectable dressage mark he was the only pony to go clear in both cross country and show jumping to win the day. The following year, same children, new ‘better’ ponies looking down on the Shetland. He did it again! By the time the third year came Abigail was asked why she was still on a Shetland. After the pair won for the third year in a row they found out! 1981 heralded the start of the Shetland Pony Grand National. Bard was invited with Abigail to take part in the first display races at Olympia. It was after the success of this display that the present qualifying displays were developed. For the following three years Abigail had to qualify Bard to race at Olympia which of course he did. At the end of 1980 Bard had a change of show jockey and Sarah Rogers took over the ride. At this time the M & M WHP classes were in their infancy with two height sections. 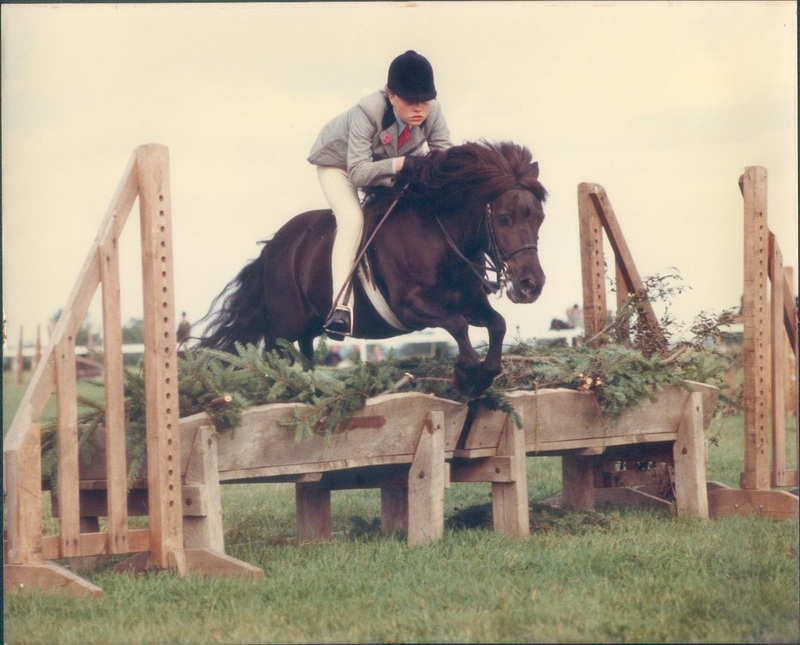 The height of the jumps for the small section was 2’9” with a 3’ spread, no mean feat for a 39” Shetland. With Sarah at the helm the two jumped their way round many of these courses. In the NPS Championship at Malvern there was one jump that was just a single pole at 2’9” with no ground line and no filler. When approaching the jump you could see Bard looking and thinking “do I go over or under?” When he reached the jump Sarah said over, so over he went! Well, after such a clear, how could anyone beat him. They went on to win many more championships over the next four years. Bard had another change of rider in 1985 with Sarah’s younger brother March Rogers taking over the ride. They were having one of the best years ever, then in the middle of August Bard fell seriously ill and for a while we did not know if he would recover. He had caught a virus whilst stabled at a show. It was not until after Christmas that we knew he was on the mend. 1986 and Bard bounced back. After a quiet start to the season he went to the East Anglian Native Show and was Champion M & M WHP and Reserve Champion Ridden M & M. He then went on to the Shetland Breed Show where he won the until now illusive qualifier for Olympia. We knew the ring and the atmosphere at Olympia did not phase Bard as he had been there many times with the racing from which he retired after his illness. March had been going to Olympia taking part in the finale since he was a baby in a pram so going into the ring did not worry him. The night before the class 10 year old March was at the groom’s party until 3am! Sarah exercised Bard in the morning, March nowhere to be seen. In fact he was ready for the class wrapped up in Bard’s blanket fast asleep in the stable. Most riders thought that Sarah must be riding Bard in the class. When it was time to go in the ring March was woken, sat on Bard’s back and sent into the ring. The pair did a foot perfect show for Ride Judge Mrs Furness. Confirmation was judged by Mrs Taylor. We now had the long wait for the afternoon performance for the result. Before entering the ring in the afternoon March kept insisting that Sarah tell him how to do a Lap of Honor. She said he wouldn’t need to know but told him anyway. Bard qualified again the following year and this time was placed 4th. The Shetland Performance Awards was started in 1980 and between 1981 and 1991 Bard was Overall Champion 8 times and Reserve Overall 3 times. We decided to retire him from the ring at the end of 1991. He has since taught many children to ride. Bard died on 17th August 2005 and will be much missed by all who knew and loved him.